Although Pantai Kok too is located on the western coast line of Langkawi's main island, when it comes to nightlife, bars & pubs, it certainly can't compete with Pantai Cenang and Tengah that are only 15 minutes drive down south. In Pantai Kok, there are essentially couple of options. 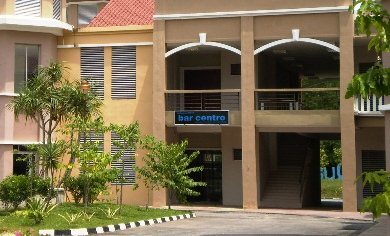 Either you visit a bar or a lounge in a luxury resort hotel in the area which remain open till late hours, or visit one of the bars or restaurants serving drinks at the Perdana Quay on Telaga Harbor. If you are staying in a hotel in Pantai Kok, then Perdana Quay would offer a nice alternative to the resort bars which are in general quite expensive. 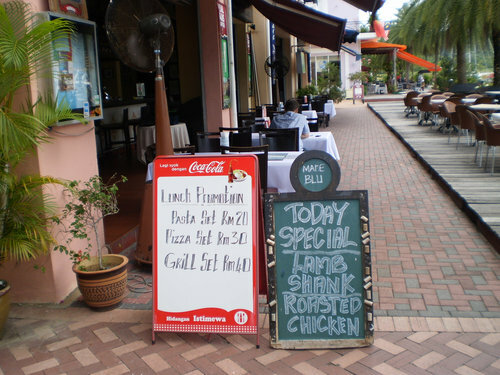 Having said that, most bars & restaurants in Perdana Quay are also quite upscale and drinks & food are not inexpensive. They are mainly patronized by the yachties who have their boats moored at the adjacent marina and also by some affluent locals. However the ambience along the boardwalk facing the harbor is simply magnificent. This is where most of the popular restaurants & bars are located. And they remain open till late. Take a table next to the boardwalk, have a drink and watch the glorious sunset on the harbor as the row of palms sway in light breeze, this is a great experience to remember. You will also get a vibe of the yachties community, friend circles and what they chat about. 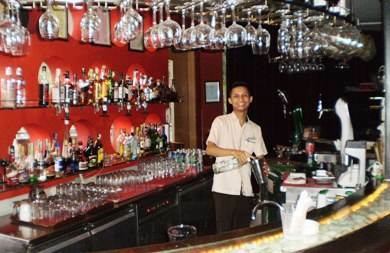 This is a lively upscale bar in Sheraton Beach Resort located in Pantai Kok. It has both indoor and outdoor space. Outside there is a lounge where gazebo like structures are created for seating. With comfortable sofas, transparent curtains swaying in the breeze and wonderful view of the ocean, the outside seating can be very pleasing and romantic. Inside with bright crimson red decor, comfy couches, live band playing all sorts of numbers including rock, reggae and even 70's hits and DJ spinning contemporary numbers, the spirit gets lifted as time progresses through the night. The bar is very well stocked but drinks are expensive. Happy hour is between 6pm to 8pm when drinks are discounted. The staffs are very friendly & always smiling as you can see in my picture below. 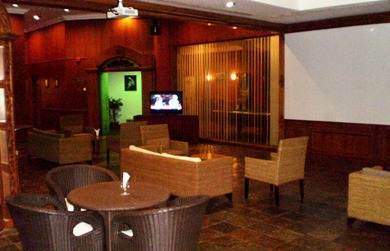 There is also LCD TV next to the bar playing sports channels. For eats you get light fares & snacks. Overall the atmosphere is relaxed, safe and friendly. In case you want to go back by a cab (self driving is not recommended along the winding roads in this part of the island if you have already indulged quite a bit), the staff will arrange a cab back to your hotel. 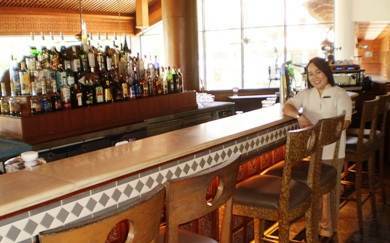 The bar is patronized by many affluent locals and even returning tourists other than of course the hotel's own guests. We keep returning to this bar every time we want to have a great evening until late hours. Note: Earlier there used to be live music with dance in Chime. However since sometime, it's mostly background musing or DJ spinning, but no dance. Earlier Chime is to be open until 3am, now it closes at 1am. Open Hours: 6pm to 1am. Dress Code: Smart Casual. This is a music bar located inside Perdana Quay. Often there is live musical entertainment from the local bands. As the night progresses, the patrons start trickling in, and the tempo starts picking up in the late hours when people start making their dance moves to the music. The bar is well stocked. Beer is well discounted and cheap during the happy hours. There is also a large LCD TV showing sports channels. Open Hours: 7pm – 3am, daily. 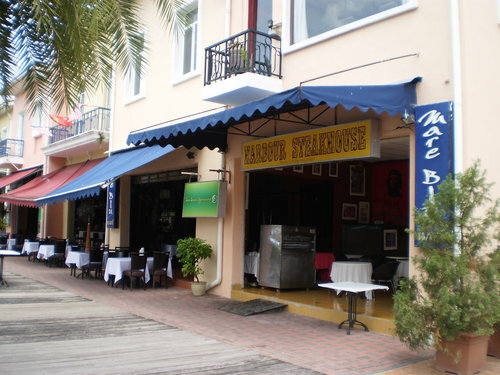 Operating since 2004, Mare Blu is a popular Italian restaurant & bar in Perdana Quay. It's located on the boardwalk and facing the harbor, and offers a wonderful view of the water. 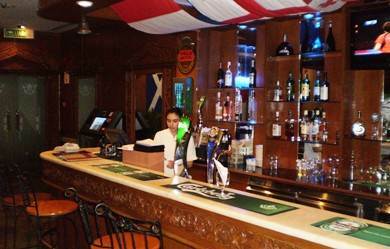 While they boast of authentic Italian fares including large selections of Pizzas & Pastas, as well as several other dishes like BBQ Chicken, Fisherman Platter, Lamb Legs etc, they also have a very well stocked bar. Beer and other drinks are reasonably priced. You can choose from over 60 different concoctions. There are both inside and outdoor seating. 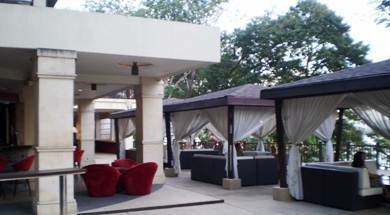 This is an elegant upscale lounge at the Berjaya Resort located next to the main lobby. With slanted wooden ceiling, scattered luxury wicker sofas and a plush well stocked bar hosted by a beautiful smiling lady, this is a great place to spend a romantic evening. Well, you will of course need to have more than some money in your pocket. After all you are in a 5-star resort. The happy hour is everyday between 5pm to 7pm when you get discounts (about 30%) on select drinks. During regular hours beer would cost between RM11 to RM16 per glass. You get a range of cocktails and even non-alcoholic beverages like coffee. There is a live band everyday (except Tuesdays) playing all sorts of numbers like reggae, blue, jazz, old hits etc. On Tuesdays a solo musician plays guitar and synthesizer. He will walk up to your seat and play a number on your request. Open Hours: 10am to 2am daily. Berjaya Langkawi Beach & Spa Resort, Burau Bay, Langkawi. One of the best restaurants in the island with a very charming interior decor with modern vibe & class of touch. While the initiative Malay and fusion food is excellent in quality and presentation, the bar too is well stocked. With in indoor seating at the first floor with windows overlooking the beautiful marina, and background music playing you can have a lovely evening enjoying your food and drink. They offer a range of beer, cocktails and wine (by the glass) at reasonable prices. During happy hour (3pm - 7pm), they offer three rolls of a dice to win a free drink. There is free wi-fi in the restaurant. This is another upscale posh lounge in Berjaya Resort. Ambience inside is darkish. There are comfortable wicker sofas for seating. The bar is very attractive and has a large selection of cocktails, beer, spirits. You will also get snacks like sandwiches, burgers, pizza, fries etc. There is a large screen with projection system. Whenever there is a live sporting event, it is normally projected on the giant screen. The lounge also has other entertainment options like pool board, darts etc. Although there is background music playing pop, jazz, blues etc, there is no live band here. Overall it's a lively club lounge type atmosphere and a bit pricey. You will mostly see hotel guests here, although the lounge has some local patrons as well. Open Hours: 11am to 2am daily.